The Basque coast is full of idyllic landscapes and typical places to visit. With the new bike path “the velodyssey”, biking becomes more accessible on the Basque coast. Biking will be the best idea to avoid parking issues and will allow you to access places easily, like going to the beach or for dinner. 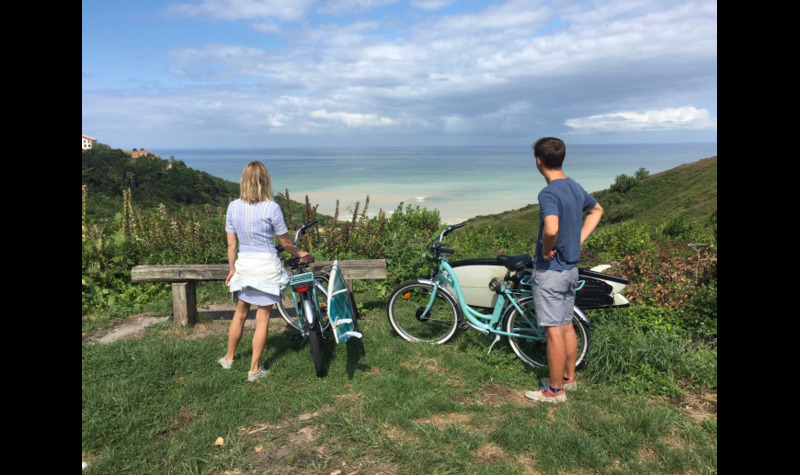 For lovers of ballades and visits, alone or with their family, you will find what you’re looking for at Marty’s place, with the bike rental service, you can rent every kind of bicycles, mechanical for the most sporty or electric for those who don’t want to spend too much energy. From € 11 per day / € 70 per week you can rent one of these bikes made in France in the city cruiser style that delight the users. And Marty has planned everything: For surfers, we can provide racks for your surfboard; If you have young children Marty can install a child seat and finally, if you don’t want to clutter with a backpack during your excursions you can equip your bike with a basket. You don’t want to bother to pick up the bikes? So just ask Marty to deliver them to your place, delivery is free over 70 € rental! Marty always providesgood tips to visit the Basque country like a local. Renting your bikes from Marty it’s guarantying a successful stay on the Basque coast.